Do you love a good salsa recipe? This is a very simple easy to make recipe and best of all you control the ingredients which means no more worrying about what is in the ‘natural flavors’ or ingredients. When you have multiple food allergies it can be intimidating walking through the grocery store. You may find that sometimes it is just better to make recipes from scratch, better to be safe than sorry. Roasting the vegetables really brings out the flavor and it smells so good. I do miss adding garlic to my recipes as I love the smell and the taste however this recipe is just as delicious without. If you are able to have garlic feel free to add some to this recipe, I like to roast a couple garlic cloves along with the vegetables. Cut and halve the tomato, tomatillos and onion. Cut the stem off of the Anaheim and cut in half. 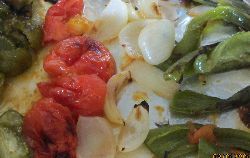 Place the tomato, tomatillos, onion and Anaheim on a lightly greased pan (I layed down foil and evenly coated lightly with olive oil). Once baked remove items and place into a blender. In the blender combine the remaining ingredients and lightly puree until smooth. Your salsa is now ready to compliment your favorite dishes! I love this salsa alongside my homemade chimichangas, tamales, Mexican chicken recipe or on top of a Mexican chicken pizza which of course is does not contain cheese. 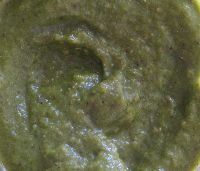 Return From Salsa Recipe to Food Allergies Home Page!